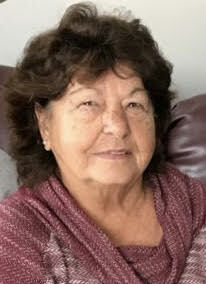 Brenda Kay Holt, 74, of Gothenburg, Nebraska, died April 3, 2019 in Gothenburg, NE. She was born August 24, 1944 in Alex, OK, daughter of Ueal and Ila Faye (Holder) Gay. Brenda grew up in Alex, OK where she attended and graduated from Alex High School. After graduation, she attended beauty school in Chickasha. She married Floyd Holt on June 3, 1961 at Alex Baptist Church in OK and they had two children - Rusty and Shellie. They moved to Gothenburg, Nebraska in 1974 and Brenda worked as a hairdresser. She later owned and operated Gothenburg Floral Express for many years. She was a member of the Nebraska Appaloosa Horse Club and received the Hall of Fame Award in 2019. Brenda was a busy wife and grandmother supporting her family in all their adventures. She was very creative in her flowers, crafting and sewing. She also enjoyed being outside fishing and gardening. She spent many hours canning her garden produce. Surviving are husband, Floyd Holt of Gothenburg, NE; son, Rusty (Kay) Holt of Lincoln, NE; daughter, Shellie Rossell of Gothenburg; mother, Ila Faye Gay, sister, Linda Ray of Childress, TX, brother, Randall Gay of Alex, OK, brother, Marlon (Janice) Gay of Duncan, OK, brother-in-law, Dan (Leta) Holt of Chickasha, OK, brother-in-law, Mac (LaFonda) Holt of Oklahoma City, OK, five grandchildren, four great-grandchildren; along with many extended family and friends. Brenda was preceded in death by father, Ueal Gay, mother-in-law, Rosa Holt, father-in-law, Reford Holt, brother-in-law, Roy Holt, sister-in-law Mimi Holt; sister-in-law Sherri Gay. Visitation will be held at Blase-Strauser Memorial Chapel, Gothenburg, Nebraska; Tuesday, April 9, 2019, 1:00 pm - 7:00 pm with the family present from 5:00-6:00 pm. Funeral services will be held at American Lutheran Church, 1512 Ave G, Gothenburg, NE, Wednesday, April 10, 2019 at 11:00 am with Pastor Jon Mapa officiating. Interment will take place in the Laflin Creek Cemetery in Alex, OK.
Memorials may be given to the American Heart Association or the Gothenburg Volunteer Fire Department.